The dictionary defines heritage as anything that has been carried over from the past or handed over by tradition. 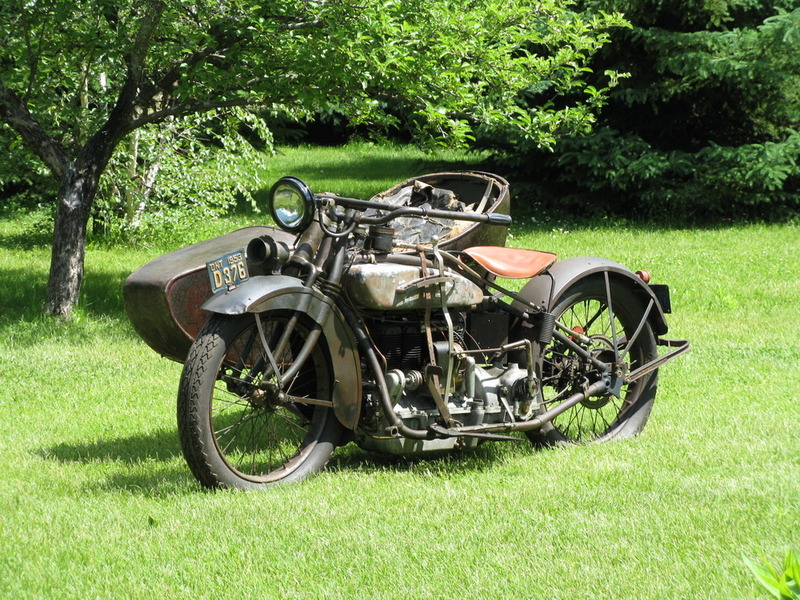 This un-restored, original 1925 Henderson Deluxe with sidecar certainly qualifies. Almost completely devoid of its original paint, it was purchased as a runner in 1999 from an estate whose successive generations had ridden and cherished it for over 65 years. Bernard Tong, its current custodian, purchased the 85-year-old diamond in the rough from the second owner, whose family campaigned it from 1933 until 1999. Originally sold out of McBride Motorcycles in Toronto, it is a 1300 cc Police Pursuit model, still sporting its factory sidecar complete with the remnants of its early leather and horsehair upholstery. These four cylinder, air cooled motorcycles were produced from 1912 until 1931. Initially the design brainstorm of the Henderson brothers, William and Tom, they were built in their factory in Detroit, Michigan until 1919 subsequently moving manufacturing to Chicago for the balance of production until 1931. During the Chicago years, the Schwinn bicycle company was involved for a period until there was a falling out. William Henderson also designed another inline four called the ACE during this highly productive period; unfortunately the talented designer was killed while testing an Ace in Philadelphia in 1922. 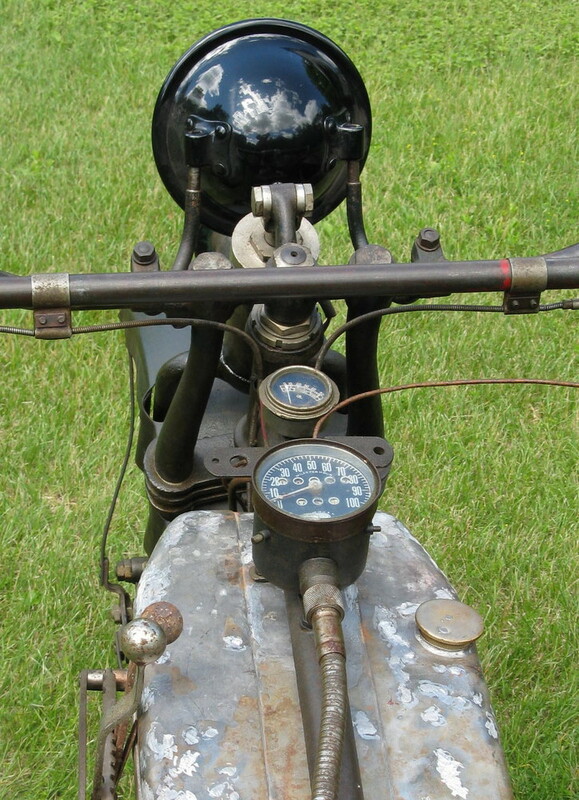 His brother Tom soldiered on with Excelsior jumping on board resulting in the 1300cc Model K Henderson-Excelsior with a redesigned overhead valve engine. All of these bikes were of similar design and proved to be robust and reliable mounts at a time when shaky singles and v-twins were the standard of the day. Unfortunately, as with many business ventures of that time, the stock market crash of 1929 ultimately caused the company to close its doors forever. a handy item for a Police Officer when dealing with law breaking 1925 era hooligan speeders! The ultimate question with a bike like this is whether to restore it to concourse condition or leave it alone with its lovely 85-year-old patina of age. Bernard Tong has pondered that question since his purchase in 1999. He has been diligently collecting parts while debating the bikes final outcome. Personally I hope he leaves it in its current condition, fixing only what is needed to keep it running. Handling history is a tricky business, and this heritage Henderson is truly a rare survivor. Museums are full of over-restored gleaming antiques, but the fact still remains, you can’t be a born-again virgin, and any classic motorcycle can only be original once. In the best-case scenario, that old term: “Being a chip off the old block” is not such a bad thing. Teaching your children to be hands-on savvy may very well be their ticket to a happy and prosperous future. From a very young age, it was clear that my father Louis could fix just about anything. When I was in grade school we lived above E&L Radio, his repair shop on St. Clair Avenue. Back in those days, people actually fixed household devices when they broke and his shop was always busy. I was accustomed to seeing the exposed inner workings of radio and television chassis glowing and humming on his workbench as he carefully brought them back to life. Despite his repeated warnings not to touch anything, I remember getting more than one electrical shock poking my fingers where they should not have been. I suppose, looking back, that my urge to emulate him was just too strong. As the years rolled by, transistors began to eclipse tube technology and my father’s career moved on, spending the balance of his life repairing household appliances. Despite a hard working life, often holding two jobs to care for his growing family, he passed away at age 63, never realizing the well-deserved peace and pleasures of retirement. His legacy however, passed down to me, was the inherent joy of fixing things. My only son Spencer started taking an interest in what I was doing in the garage just around the age of twelve. Like my father had done with me, I didn’t push him to it, but rather let his own curiosity take the lead. Perhaps the fact that he lived with my ex-wife made our time more precious, but soon he was at my side helping out and asking questions at every opportunity. Of course the fact that the shop was full of motorcycles didn’t hurt his enthusiasm. At age 14 I began teaching him how to drive a manual-shift car. He was a natural and only stalled it once before he fully mastered the technique of engaging the clutch’s friction point. It was also around this time that I gave him his first motorcycle. It was a 1965 Honda CB160 and it was presented to him in lots of boxes. It was our first serious project together and the completed project was sold to buy yet another. He really made me proud when he wrote both his Automobile and Motorcycle learners permit on his 16th birthday. Clearly the “gear-head” disease was taking hold! By then he had a nicely refurbished 1975 Honda CB200, our second project. The next season he progressed to a lovely little 1976 Honda 400-4 and became one of the cool guys at his high school, owning and riding his own motorcycle, built largely by his own hands. By 18 Spencer was already a very competent mechanic, working part time at a high-end bicycle shop using his technical skills to make money and pursue his other passion, BMX biking. His stunting escapades on You-Tube never fail to startle and amaze me. Soon his hand built BMX bikes exceeded the cost of his motorcycles and his collection began to grow. It was now crystal clear that Spencer had caught the mechanical bug. He is inherently comfortable using tools and can now fix anything he puts his mind to. These talents will follow him for the rest of his life, regardless of his future career path. Now twenty-four years old, he is just finishing his second year at Ontario College of Art and Design, where he is studying to become an Industrial Designer. Where that degree leads him is anybody’s guess. However, one thing will be certain, who ever hires him will be getting an individual that can not only think but also work with his hands, both creatively and efficiently. Unfortunately this is an asset that is in rapid decline in our increasingly “throw-away-fix-nothing” society. If my father were still alive I think he would be very proud of Spencer and what he has achieved so far. I know I am. Perhaps the ultimate beauty of fixing things is that its sublime satisfaction transcends all mechanical devices. It doesn’t matter if that device that was broken now successfully washes clothes, flies through the clouds or gracefully grinds a rail at a skate park. When it works right, and we fixed it, our joy and satisfaction is immediate. If there was only one talent that I could pass on to my son and have it stick, it is that mechanical ability. In all the follies and failures of fatherhood, I realize that being the “Technical-Son of Sam” was not always an easy path to follow. Still in spite of it all, that bench-wrenching bond has always been our common ground, ultimately making our relationship stronger. Spencer, I can only hope that your apprenticeship with me has paid off and that every time you turn a wrench you proudly acknowledge the technical roots of past generations. May their legacy and strength forever power your grease stained grip. You are, most certainly, a chip off the old block and your Grandpa Lou is surely smiling.